The Southern Trial Lawyers Association fosters camaraderie and fellowship through cutting-edge continuing legal education and access to a network of accomplished trial attorneys throughout the South. Mark Your Calendar for the 2020 Mardi Gras Conference! Don’t miss the preeminent conference for trial lawyers in New Orleans, February 19-23, 2020. Enjoy the fun while sharing strategies with some of the best trial lawyers in the country. For more than 30 years, the Southern Trial Lawyers Association has fostered camaraderie, learning, and networking among trial lawyers throughout thirteen southern states. We do not engage in political activity or fundraising of any kind, leaving those worthwhile activities to the state trial lawyer associations and the American Association for Justice. The Southern Trial Lawyers Association encompasses the following member states: Alabama, Arkansas, Florida, Georgia, Kentucky, Louisiana, Mississippi, North Carolina, South Carolina, Tennessee, Texas, Virginia, and West Virginia. We offer members two educational events a year, both overflowing with opportunities to forge professional and personal relationships that will last a lifetime. The Annual Conference during Mardi Gras in New Orleans features exceptional CLE and world class parties in one of Americans most fascinating and entertaining cities. The Fall CLE retreat is where STLA members come together to learn and share strategies in a fun and inviting location. Gibson and Kate Vance present Child Protect Executive Director Jannah Bailey with a $20,000 donation from STLA. 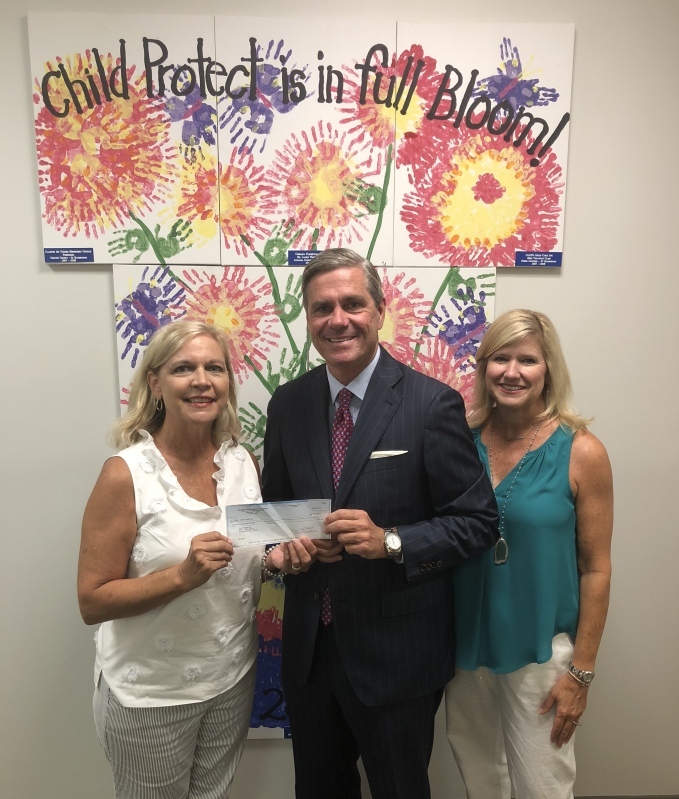 Each year, the STLA president chooses a charity to support and President Gibson Vance selected the Child Protect Children's Advocacy Center in Montgomery, Alabama. The mission of Child Protect is to interview, counsel, and advocate for children when there are allegations of abuse. Child Protect exists to minimize the trauma and help rebuild young lives shattered by child abuse. The Child Protect Advocacy Center offers a non-threatening environment where a multidisciplinary team works together to minimize any further trauma during the justice restoration process.